California has made historic progress under the Affordable Care Act (ACA) by cutting the uninsurance rate by more than half, resulting in approximately 93% of Californians now having health insurance. Health coverage affordability has improved for many, especially for those who became newly eligible for Medi-Cal or subsidized coverage through Covered California. For those who purchase coverage individually, the ACA has not only provided financial assistance to help eligible low- and middle-income individuals afford premiums and out-of-pocket costs, but has also provided crucial protections to individual market enrollees of all income levels. These protections include requiring insurers to offer insurance to all without charging higher premiums for those with pre-existing conditions, setting a floor for the share of costs that insurers cover, and establishing a ceiling on enrollees' out-of-pocket costs. However, many Californians continue to face difficulties in affording premium and out-of-pocket costs. Affordability challenges can deter enrollment in and retention of coverage, cause financial difficulties for those struggling to pay premiums or medical bills, and decrease access to care. 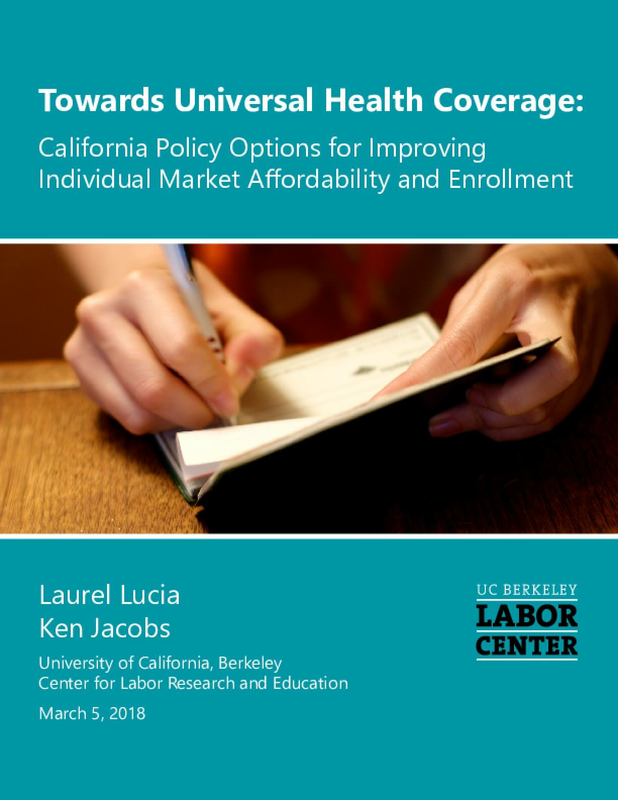 In this report, we focus specifically on the affordability challenges for the 2.3 million Californians who purchase private insurance individually and for many of the 1.2 million Californians who are eligible to purchase insurance through Covered California but remain uninsured. We also explore state policy options for improving affordability of individual market premiums and out-of-pocket costs, and consequently helping move the state closer to universal coverage. This set of policy options was developed based on analysis of the available evidence on affordability concerns in California's individual market, as well as on a review of policies used by other states and localities to improve affordability. Copyright 2018 by UC Berkeley Center for Labor Research and Education. All rights reserved.